In1989, Rich made his move to Nashville, where his first performance was on the world famous Grand Ole Opry. Soon after he was asked to join country music hit maker Eddy Raven on tour. From there Rich began a steady run of touring and recording with artists including John Berry, Becky Hobbs, Rodney Atkins, Steve Azar, Mel McDaniel, and Blake Shelton. Always working steadily as a musician Rich has been fortunate enough to perform with many of music’s top icons including Charlie Daniels, Willie Nelson, Ted Nugent, Sammy Hagar, Merle Haggard, Steve Cropper, Glen Campbell, Joe Perry, Delbert McClinton and Jerry Lee Lewis. His touring has taken him around the world, performing not only in the U.S. and Canada but also throughout Europe, the Middle East and Japan. In 2006 Eckhardt stretched out into the film world when he was asked by Toby Keith to play the part of his guitarist in the Paramount movie “Broken Bridges“. He has also appeared in several episodes of the ABC hit series Nashville playing the bandleader and guitarist for Will Chase's popular character Luke Wheeler. Rich has also appeared in over a dozen music videos, two television commercials, numerous guitar magazines including Guitar World, Guitar One, Premier Guitar and 20th Century Guitar. He has even turned up on a billboard in downtown Nashville TN. In 2005 Rich release his first solo effort. An instrumental collection of his original songs raging in styles from the melodic acoustic ballad “Old Chanoanon River“ and Jazzy “Catalina” to the Jeff Beck inspired title cut “Soundcheck“. The critically acclaimed CD became an instant favorite among fan across the country. 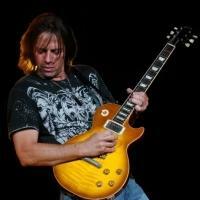 In 2008 Rich began writing a monthly column called Shifting Gear for Premier Guitar Magazine. In 2009 Rich released the much anticipated follow up CD Cottage City Firehouse. On it he wrote “Bldg.55” from his experiences in Iraq while entertaining U.S Troops in Baghdad He also threw down on the quick pickin’ “Chicken Fingers” and paid homage to fellow DC area legend Danny Gatton on the title cut. Today, Eckhardt is extremely busy, balancing his hectic touring schedule with studio sessions, and television appearances. Rich has performed in nearly every major concert venue in the world, played on multi-platinum and Grammy winning albums, entertained for three American presidents and has been seen on most of the industry’s staple television shows including the Tonight show and Superbowl XXXVIII.